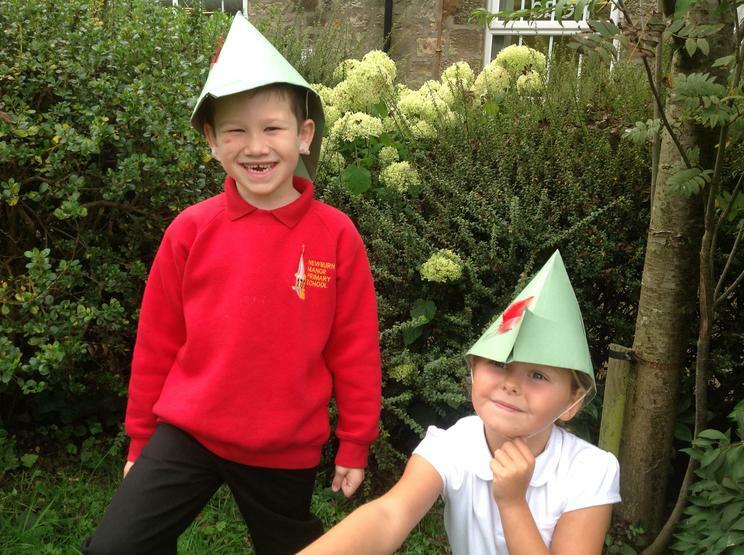 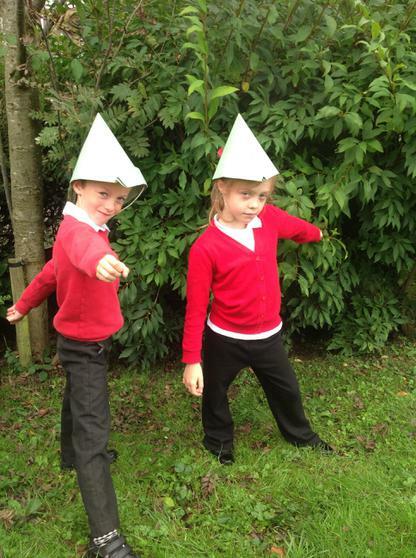 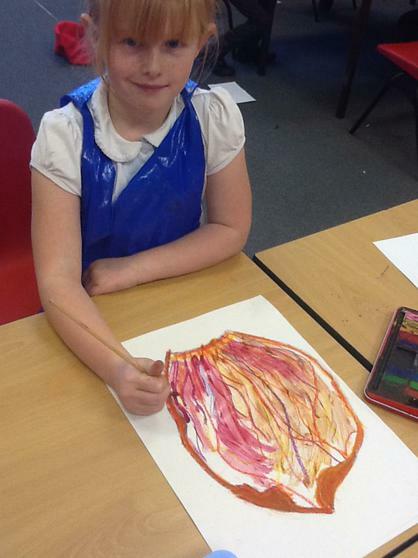 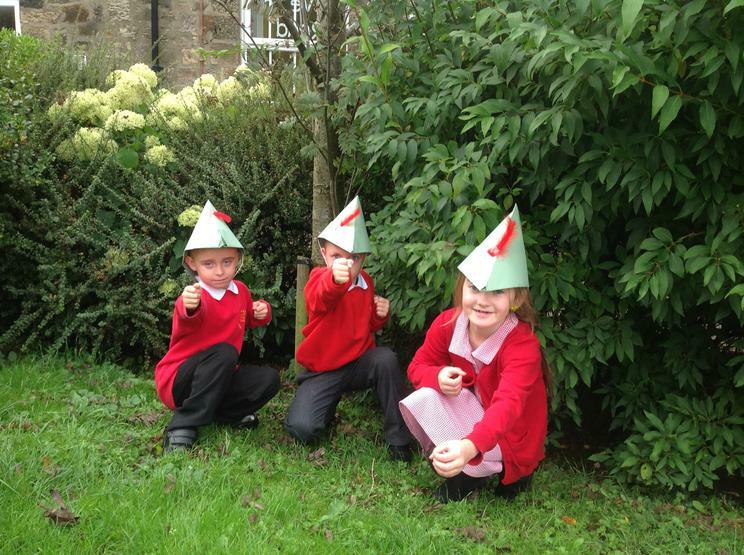 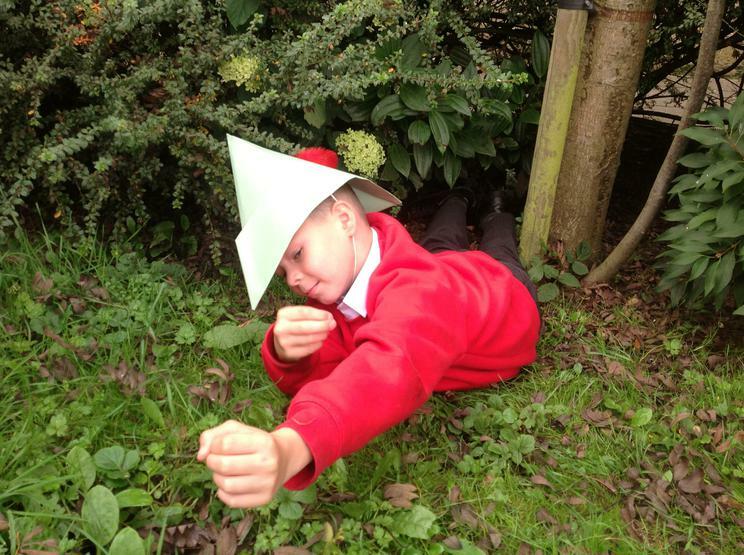 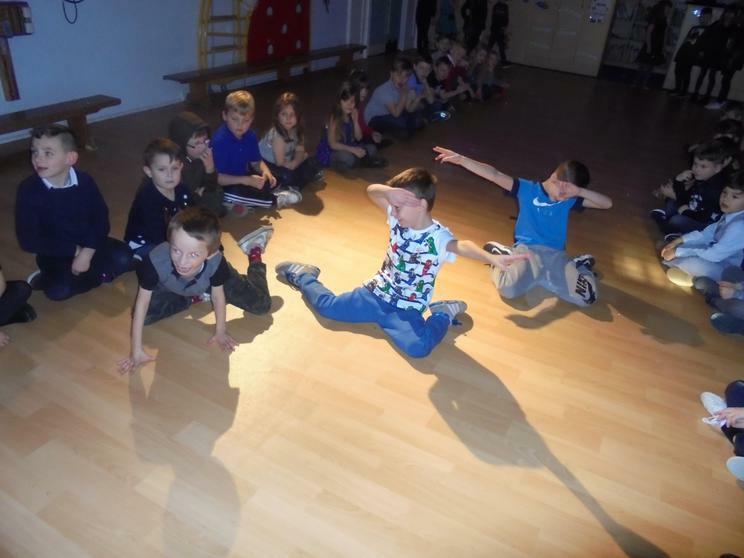 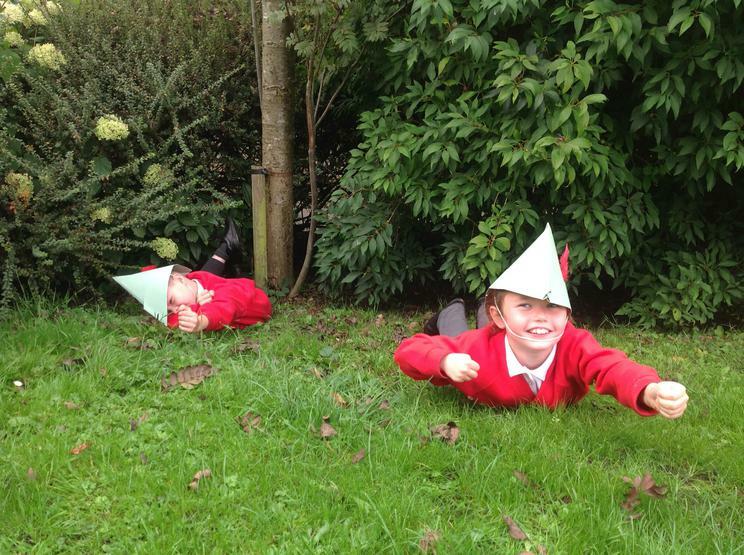 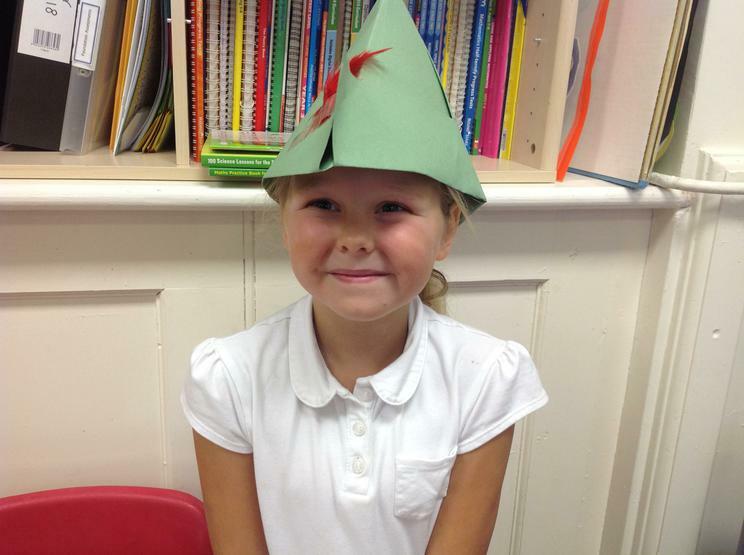 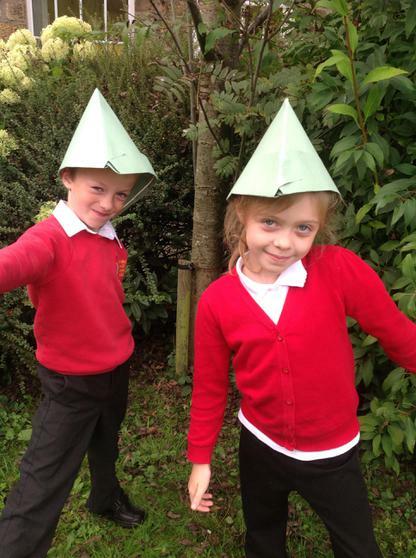 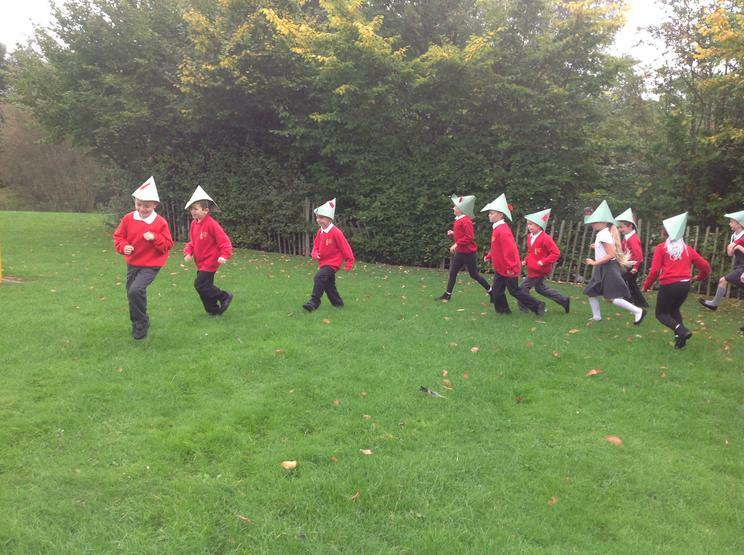 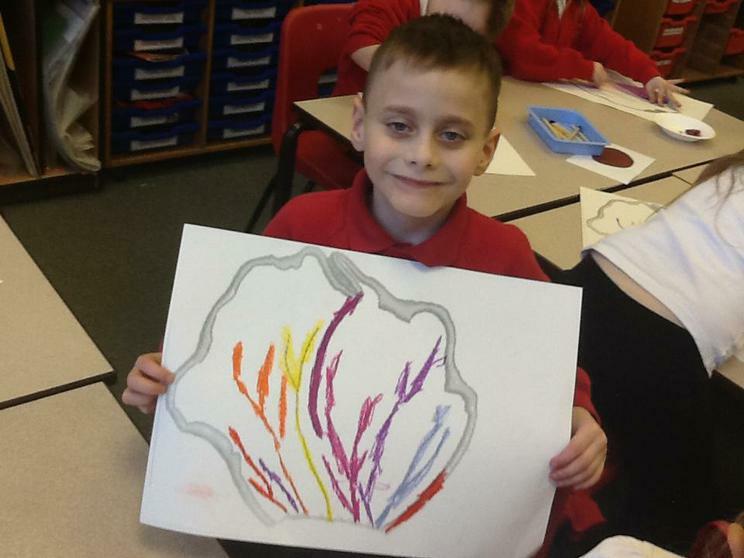 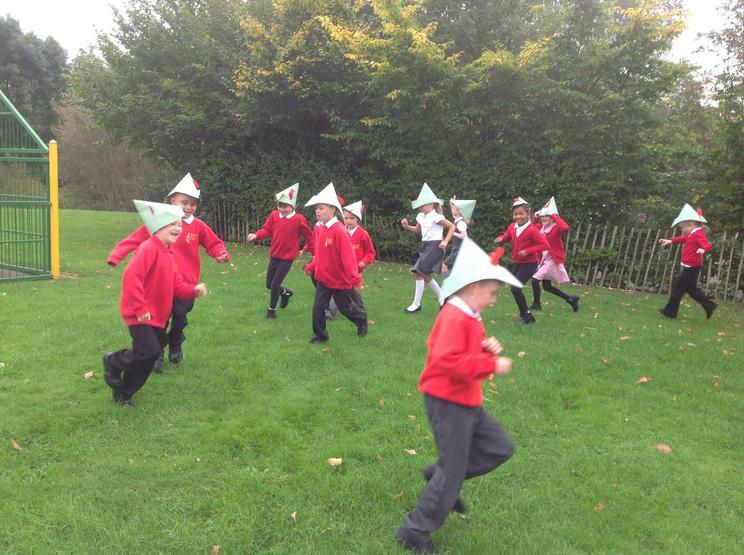 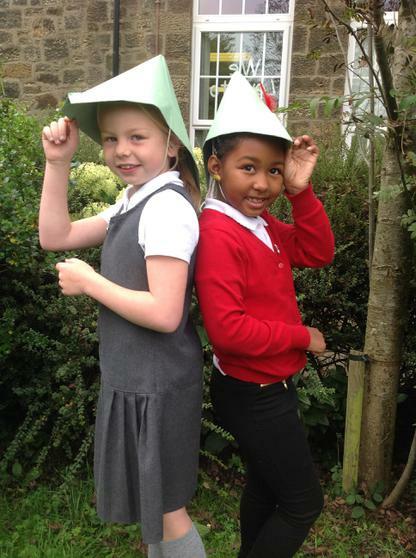 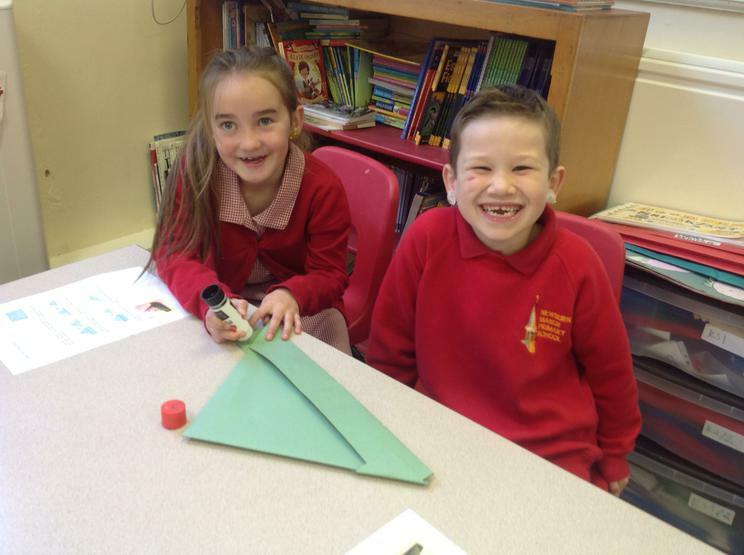 Find out what Year 3 are up to Autumn A! 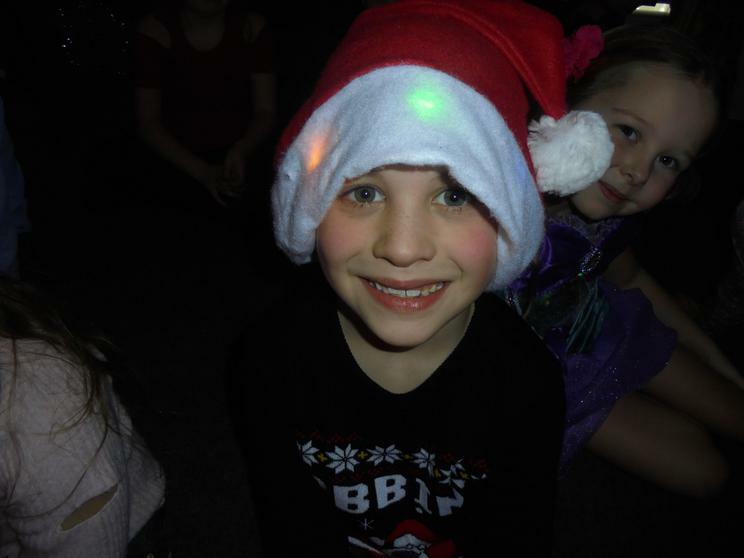 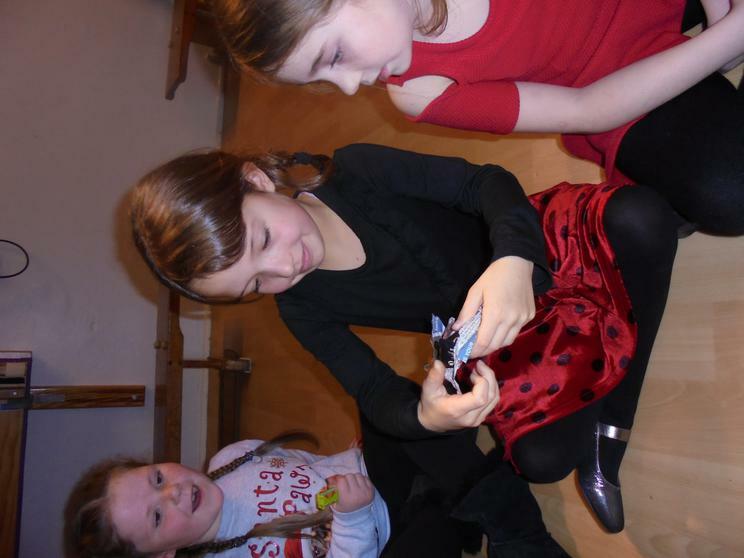 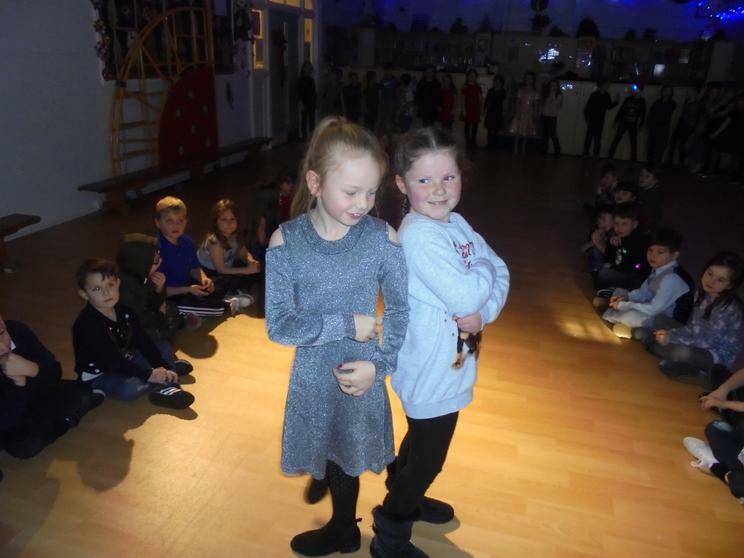 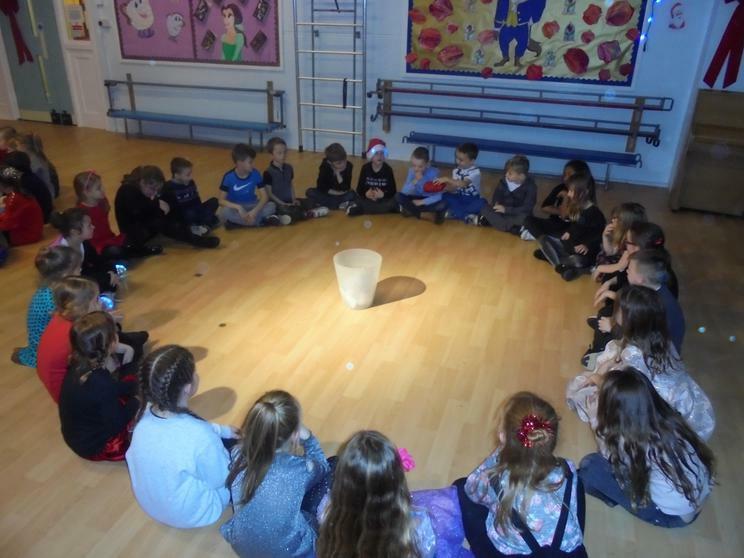 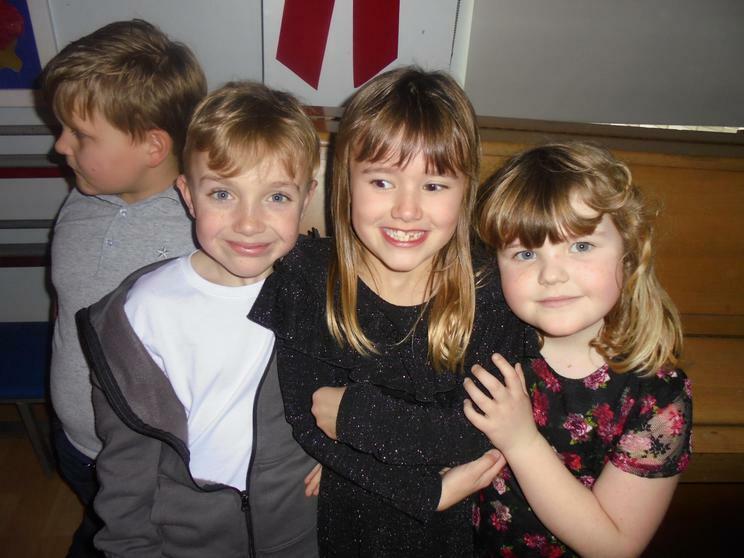 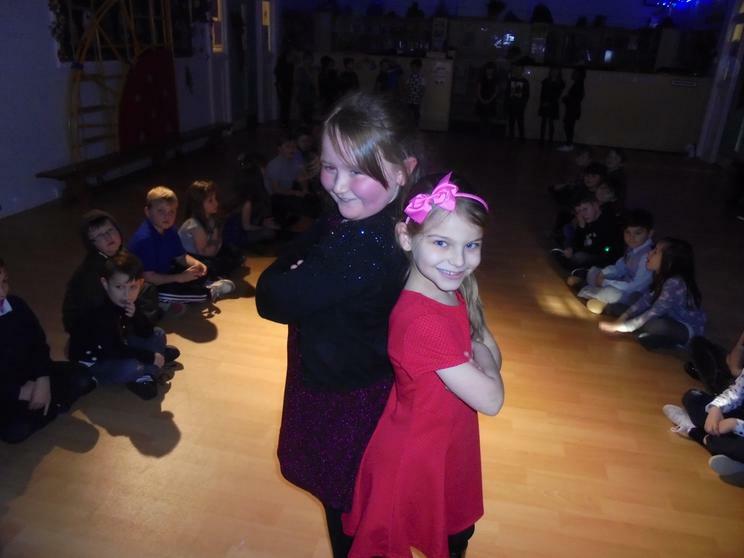 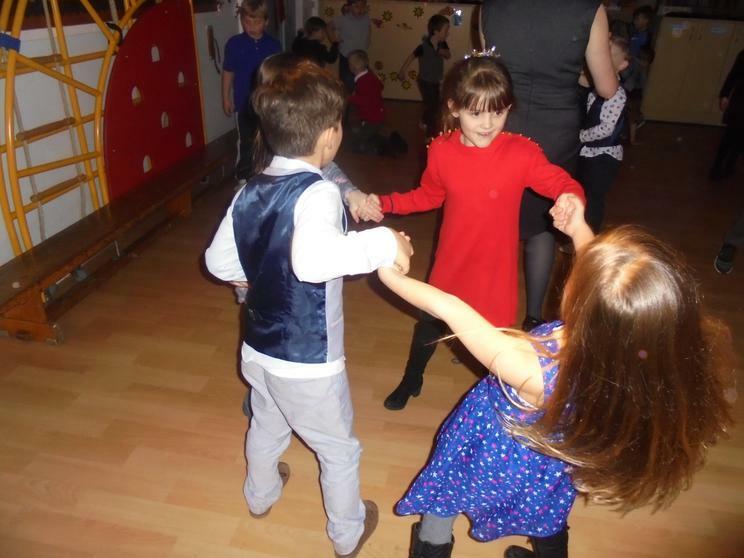 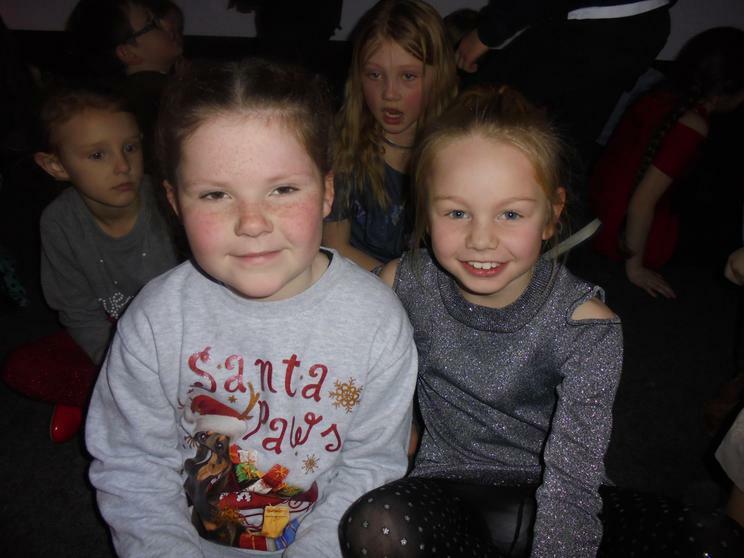 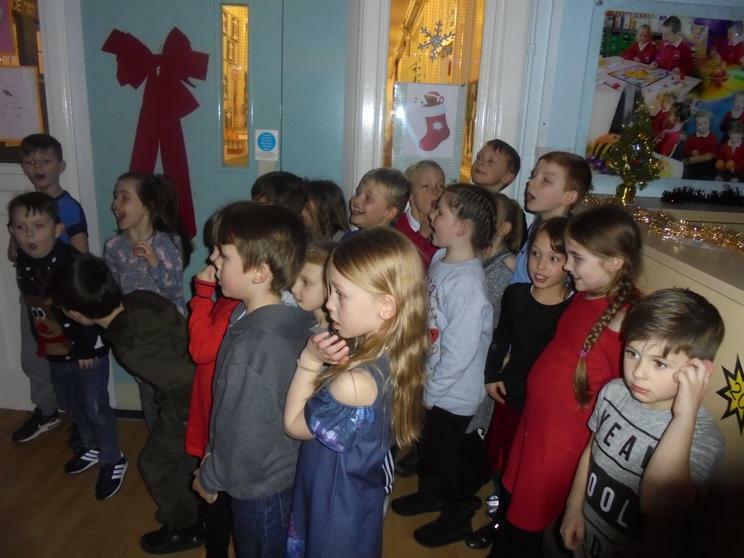 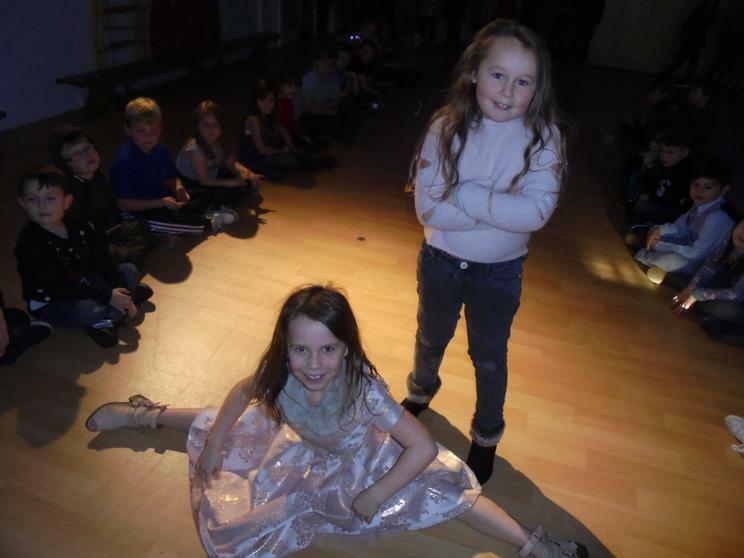 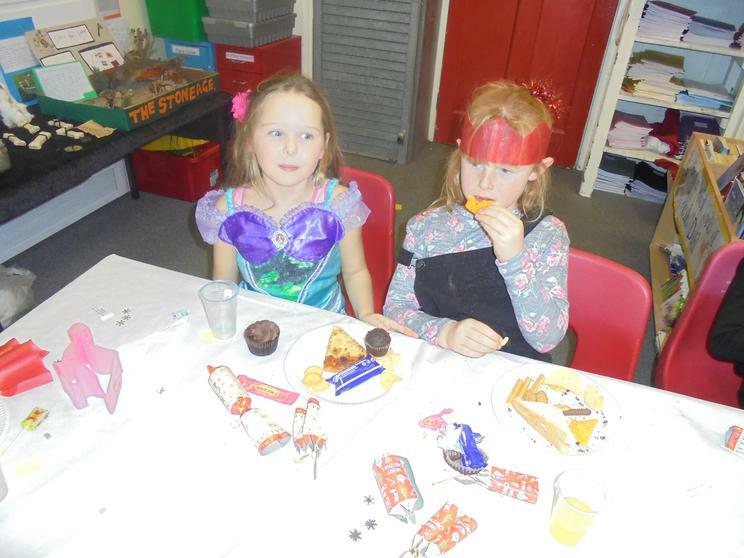 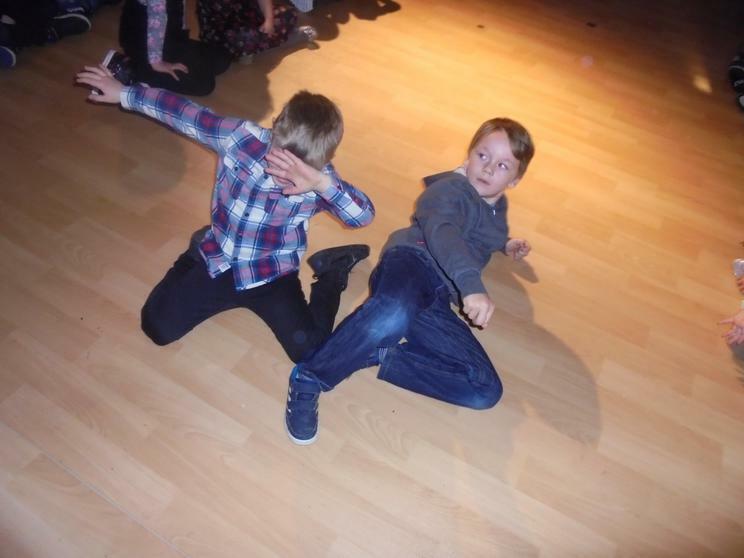 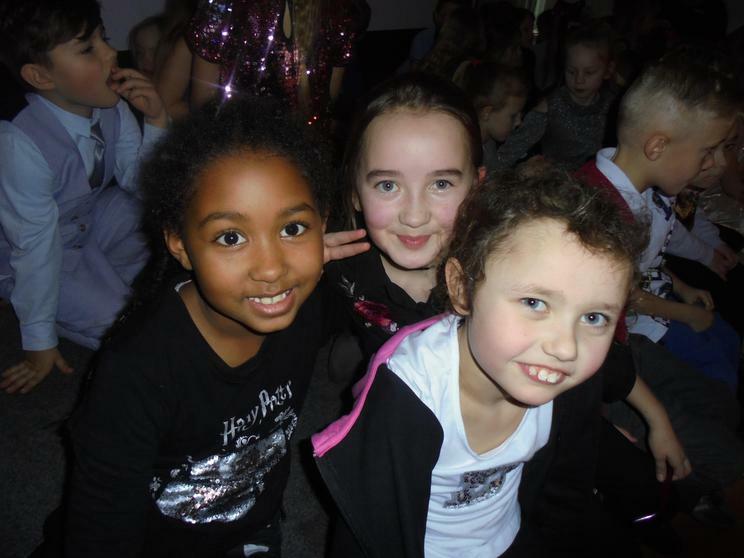 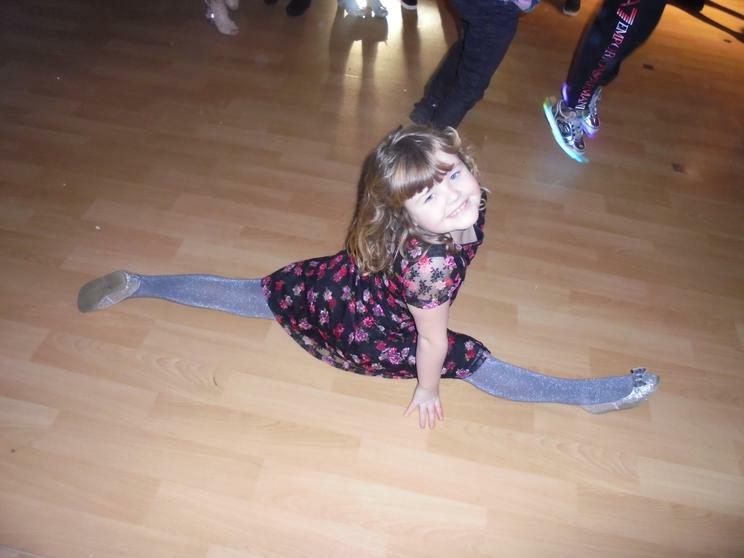 We had a fantastic time at our joint Christmas party with Year 2. 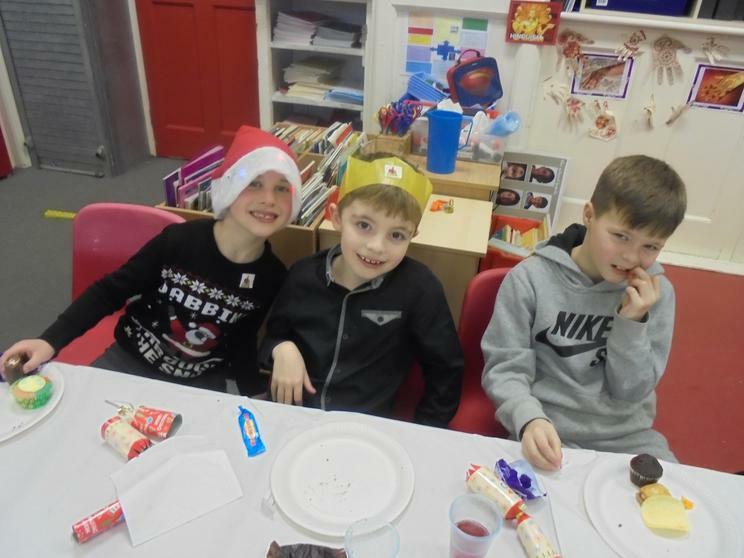 Many thanks to everyone who sent in food for the party - we had a delicious festive feast! 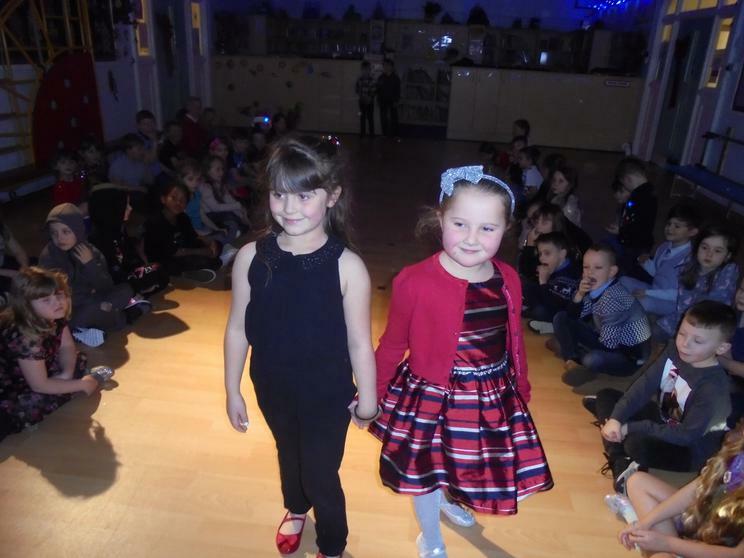 Please take a look at some of our photos. 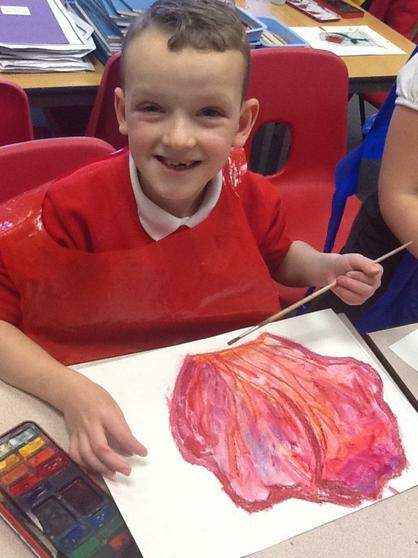 For Christmas this year, we are working with Year 6 on a wall display about the Beast and the magical rose from the fairy tale Beauty and the Beast. 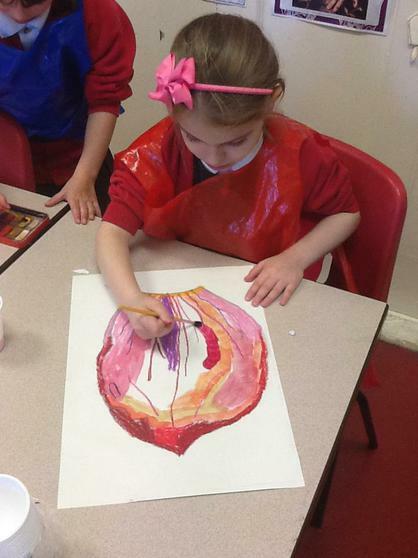 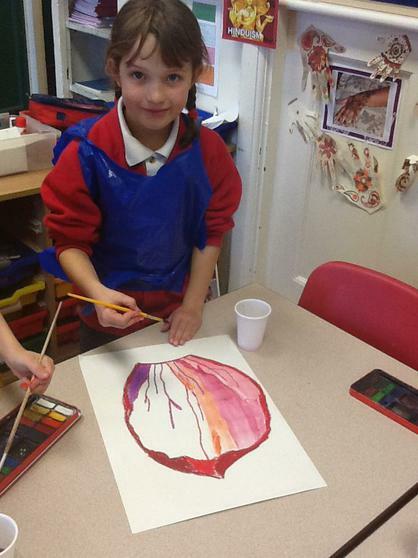 We have been looking closely at rose petals and all the different types of reds created by the light. 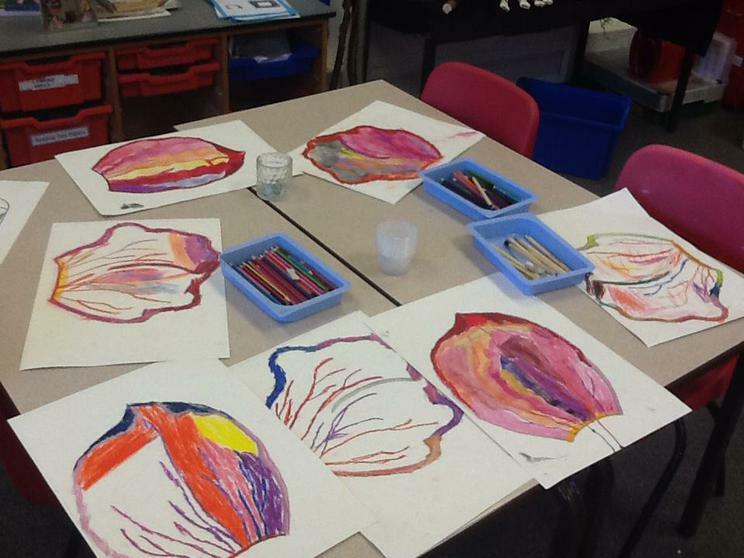 We used oil pastels and paints to create light and dark on the petals. 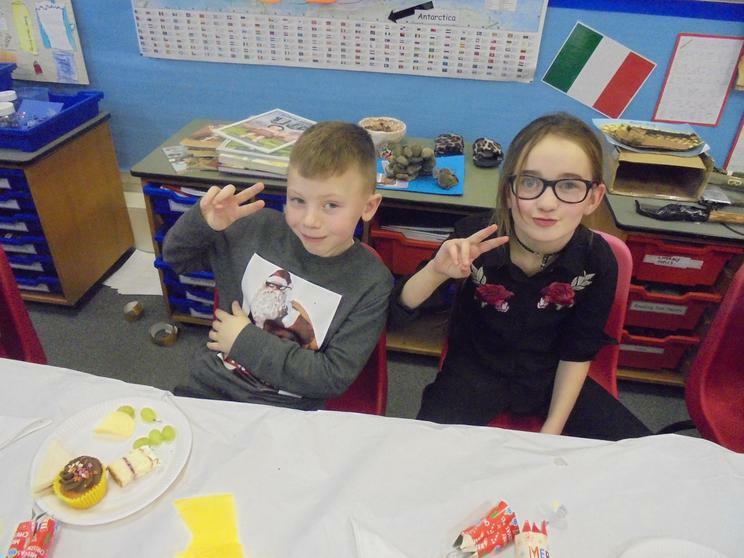 In Families, we have been learning about different countries in Europe. 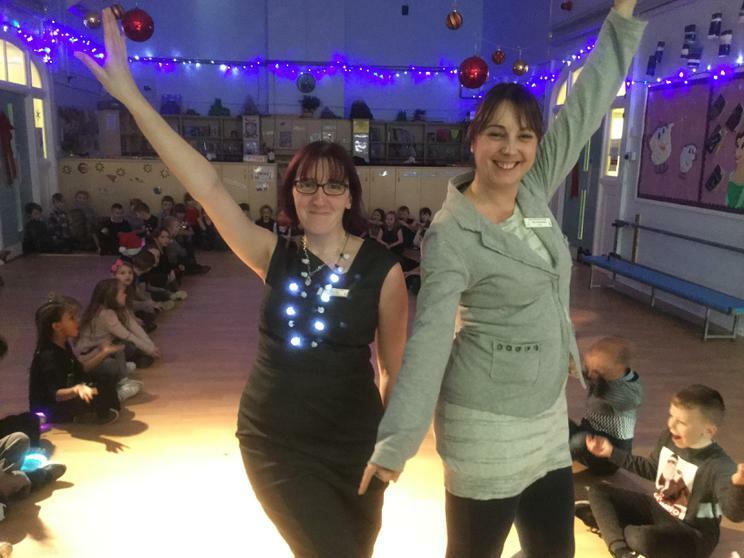 We had a visit from Le BiblioBook Bus. 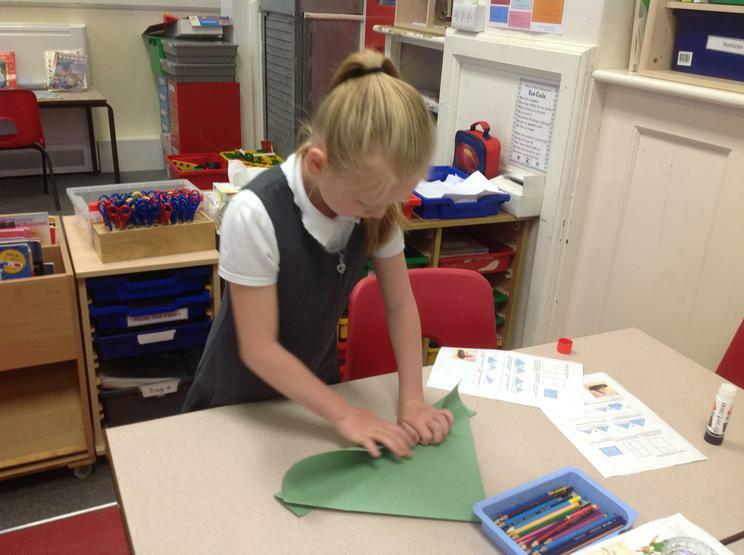 We really enjoyed hearing different stories in French and telling the stories using puppets. 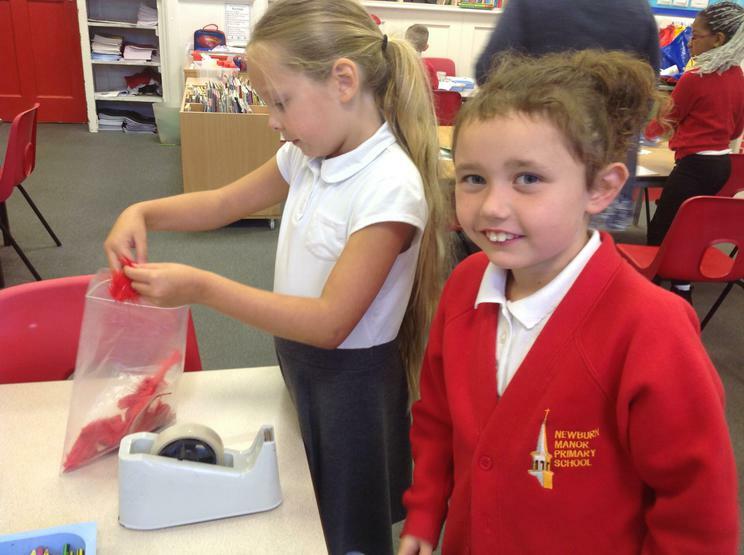 We learnt lots of new French words. 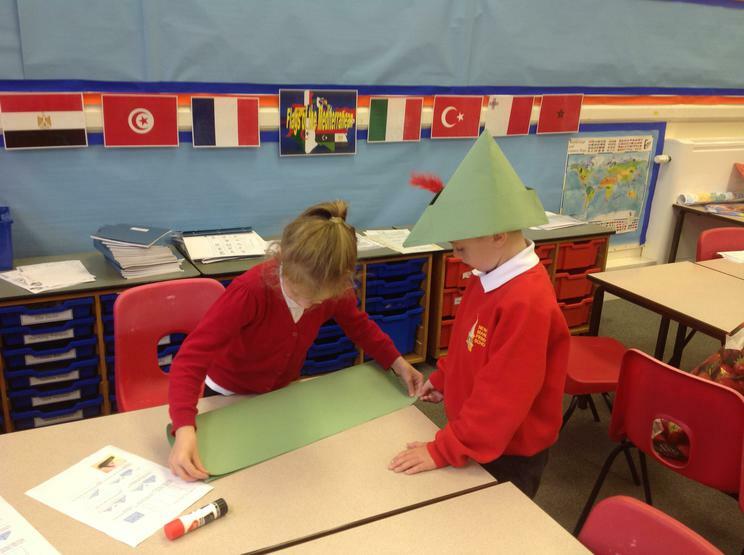 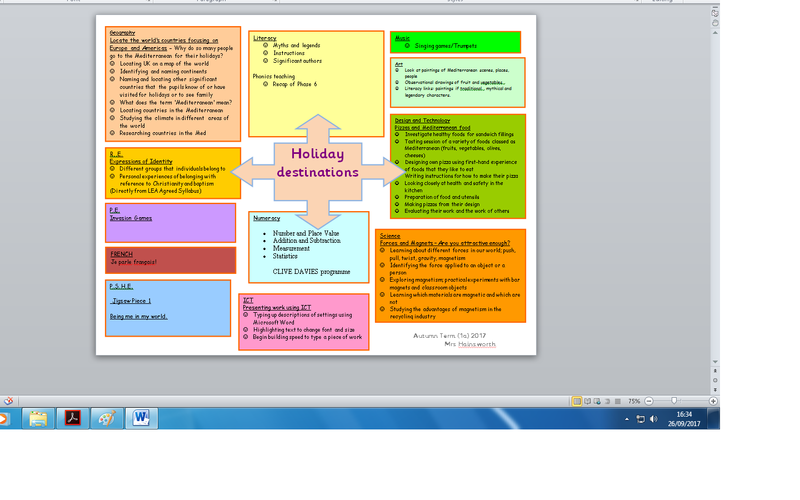 We created a story map of the key events in the story ‘Stone Age Boy’. 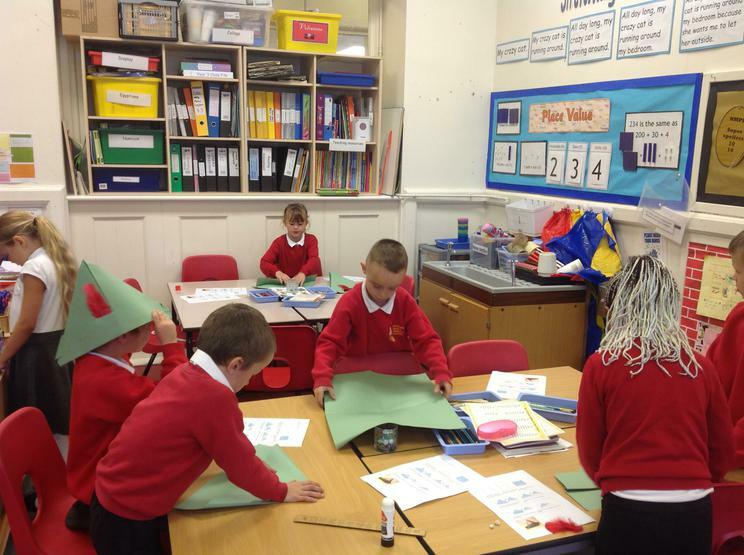 We use it to retell the story to our talk partner. 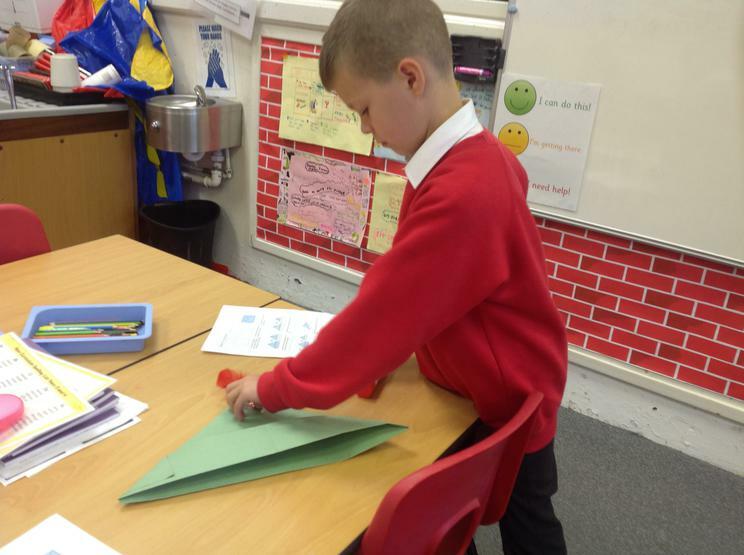 In our grammar lessons, we have been learning to use speech marks. 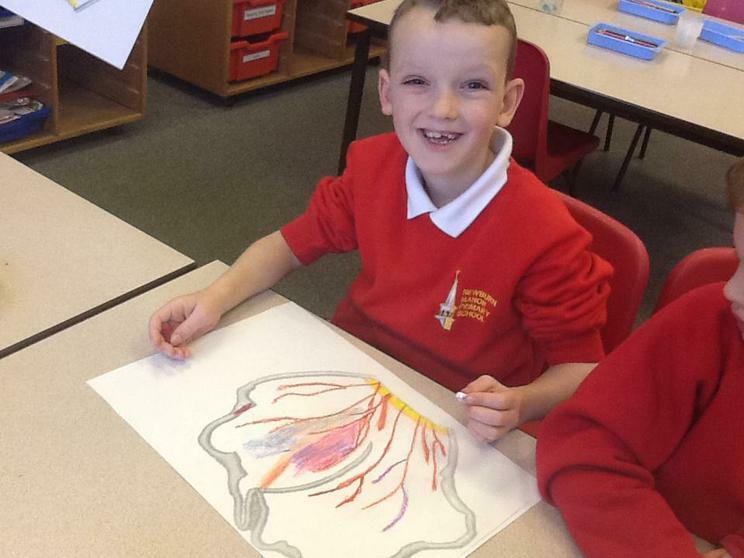 We have written our own version of the story using speech marks to show the conversations the boy has with a Stone Age girl named Om! 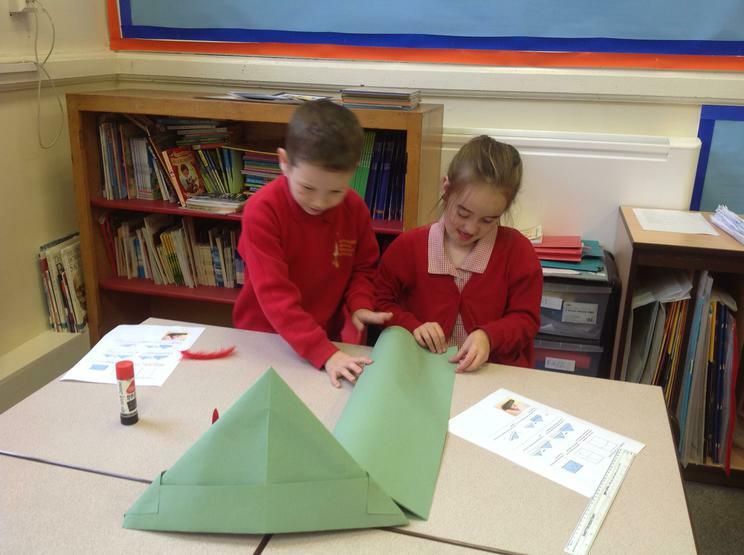 In Year 3 we have started a new topic about the Stone Age. 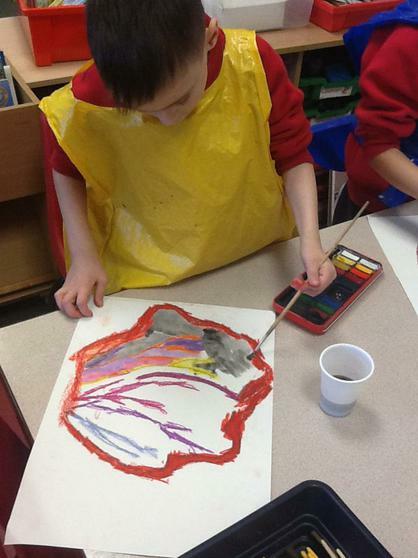 We read ‘Stone Age Boy’ by Satoshi Kitamura, about a little boy who goes back in time to the Stone Age. 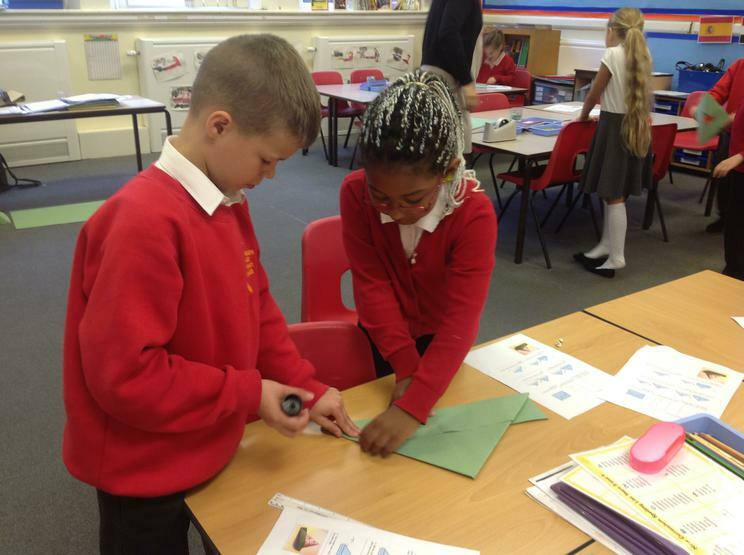 We created a working wall of evidence from the text which indicated that the boy was in the Stone Age. 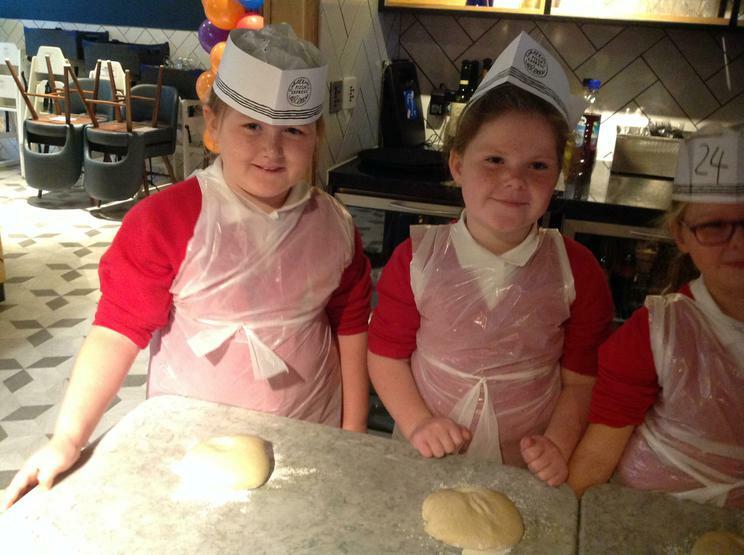 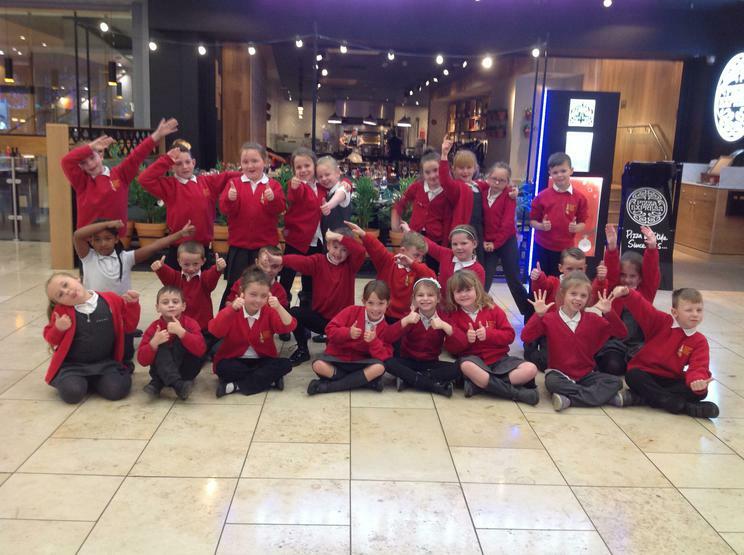 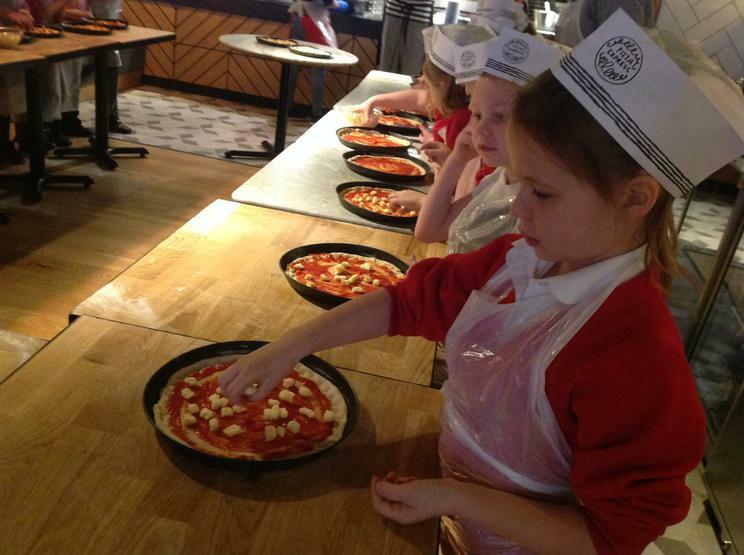 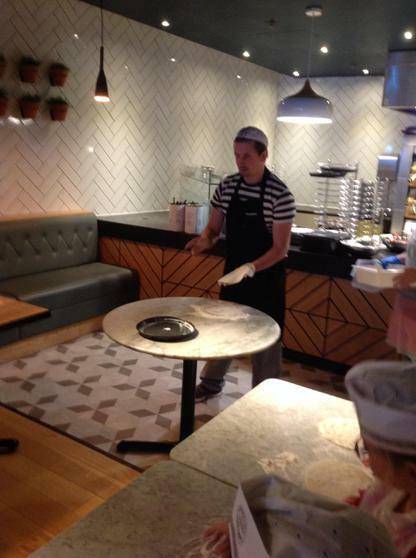 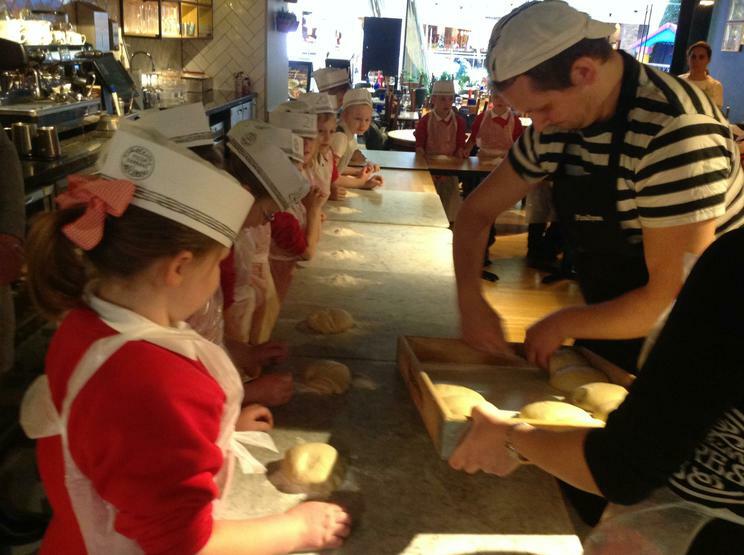 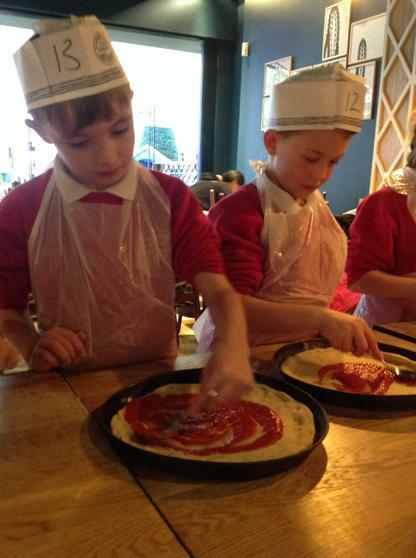 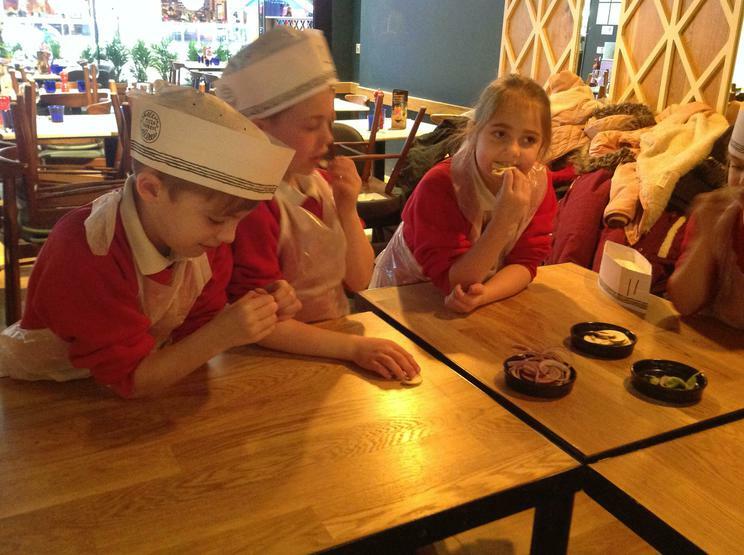 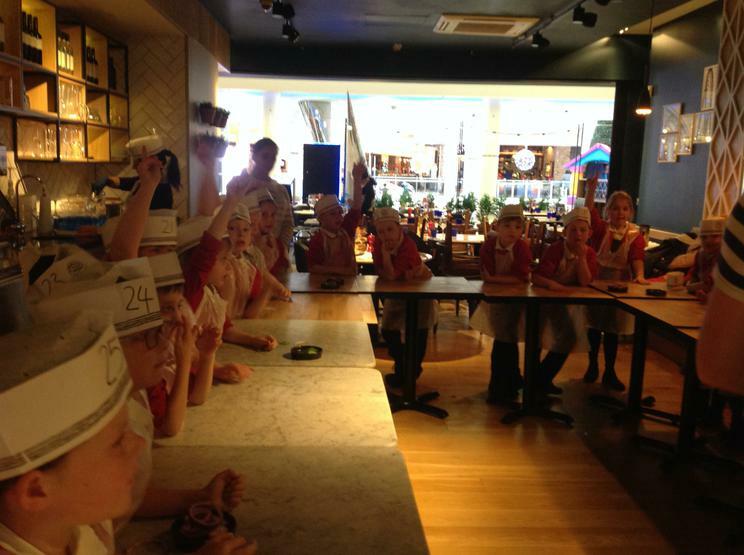 We had a brilliant morning with friendly staff from Pizza Express at the Metrocentre learning how to make pizzas. 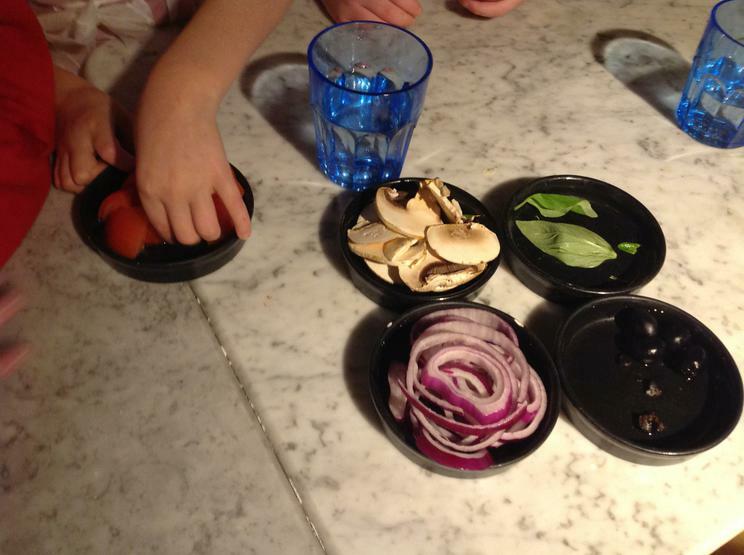 The pizzaiolo (pizza chef) taught us how to make a famous Italian classic: the Marguerita. 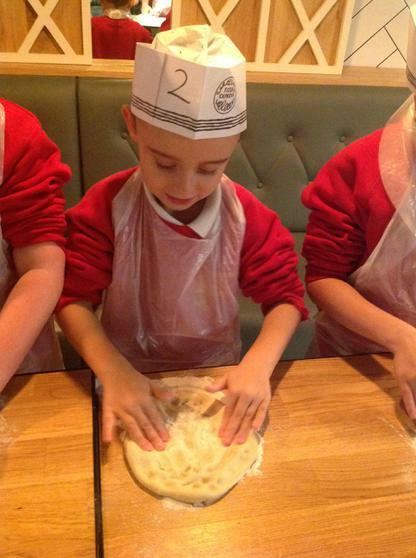 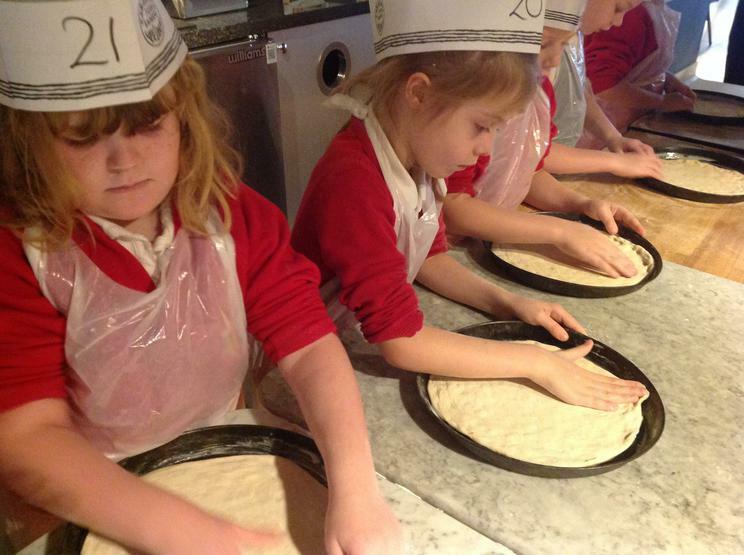 After washing our hands and donning aprons, we kneaded dough until it was lovely and smooth to create the perfect base. 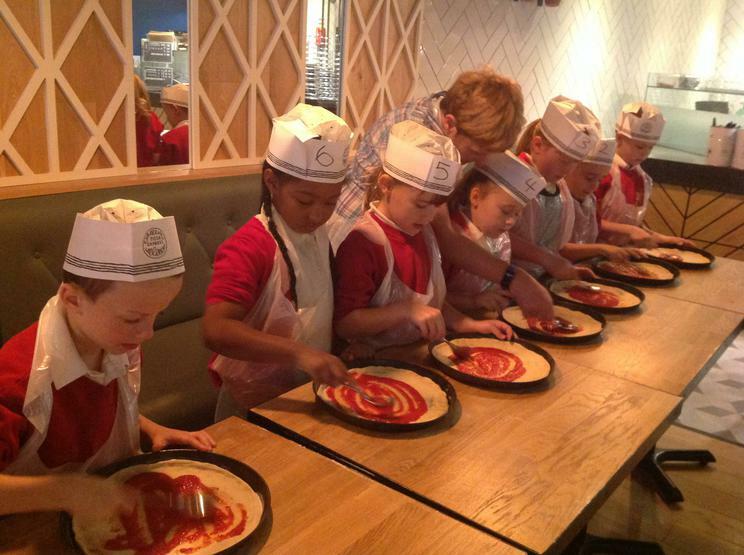 We discovered how important fresh ingredients are to the pizza's flavour, then topped our pizza bases with passata, mozzarella and oregano. 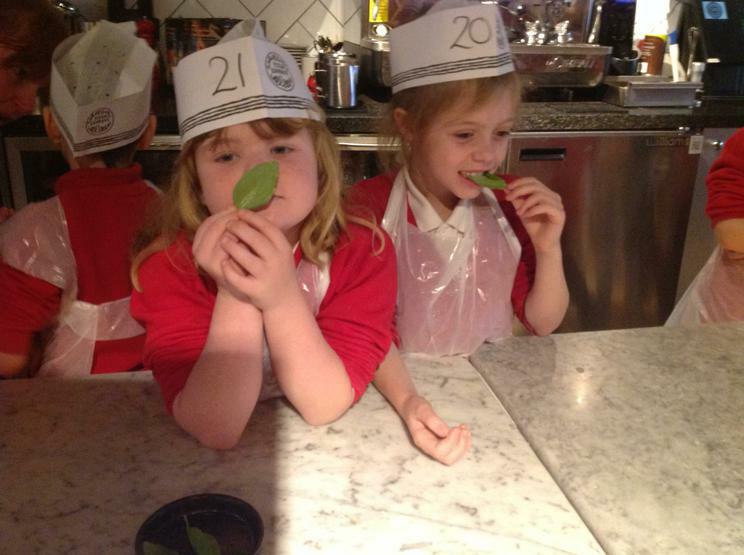 Whilst we were waiting for them to cook, we tasted and learned many facts about different ingredients, eg olives, tomatoes, basil and onions. 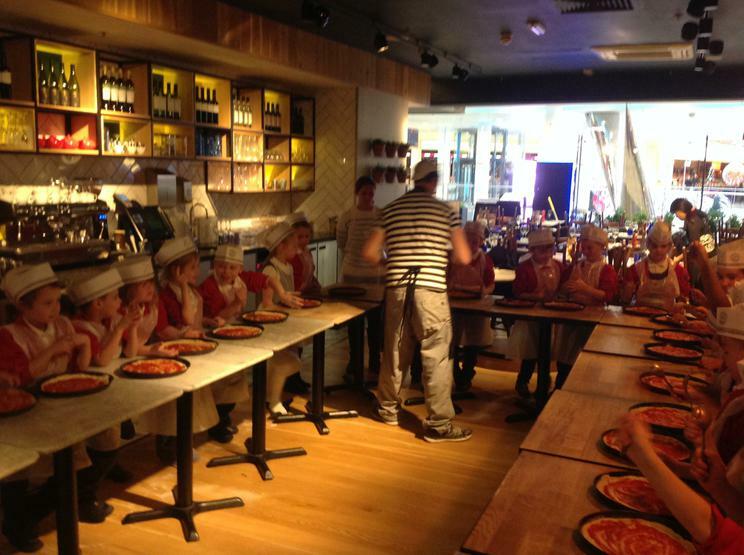 The cooked pizzas were then put inside boxes for us to take away. 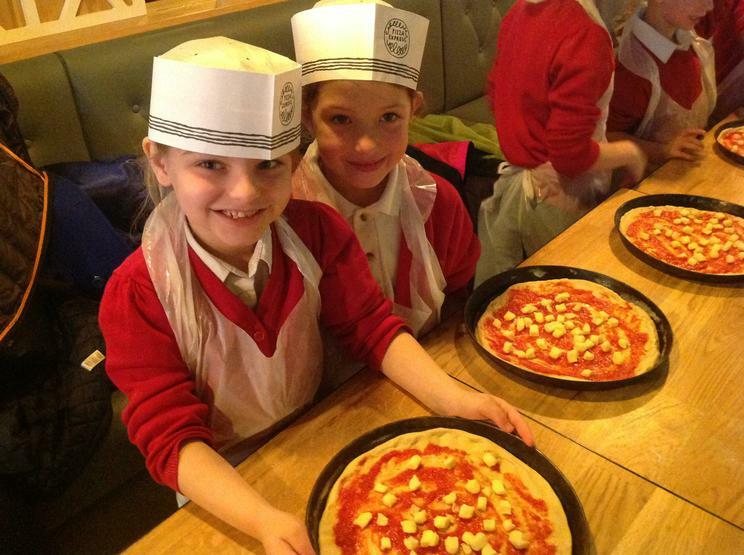 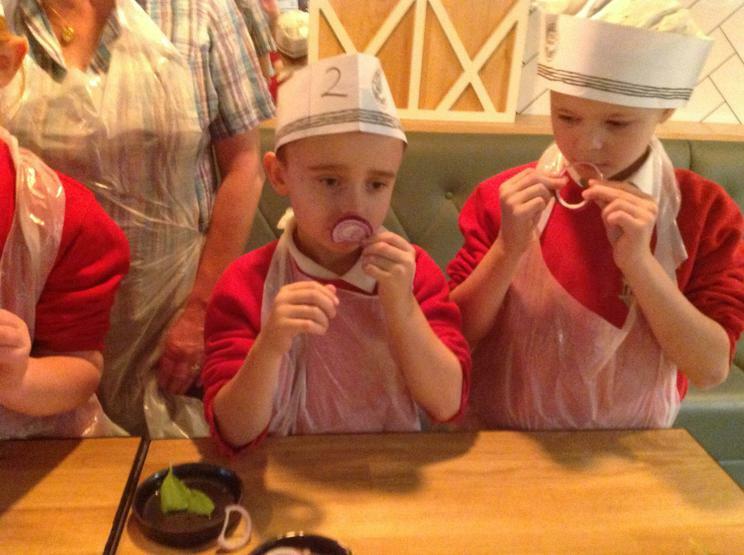 Thank you Pizza Express! 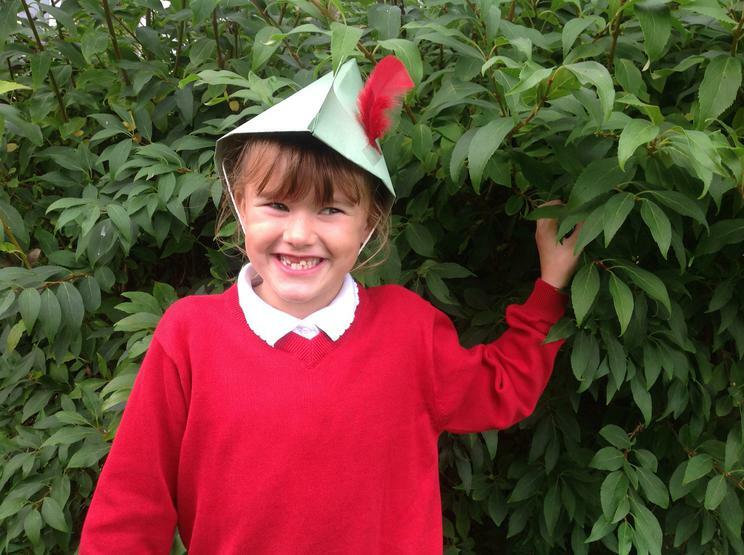 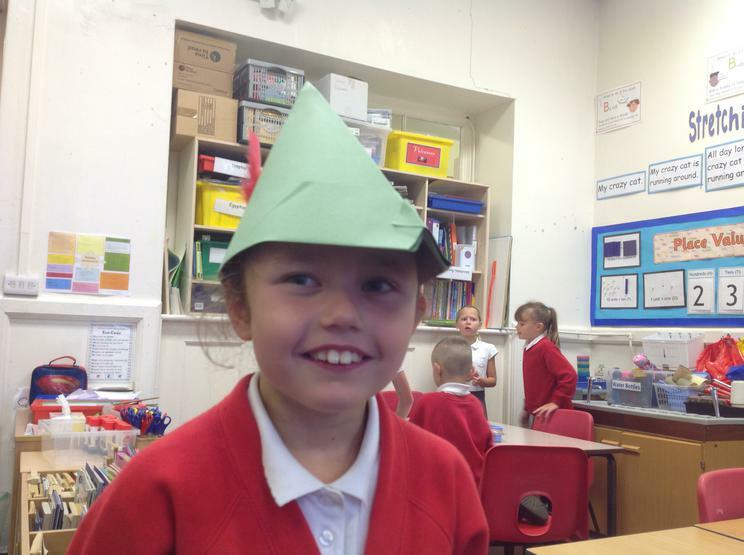 As part of our Myths and Legends topic, we have been learning about the legend of the heroic outlaw, Robin Hood. 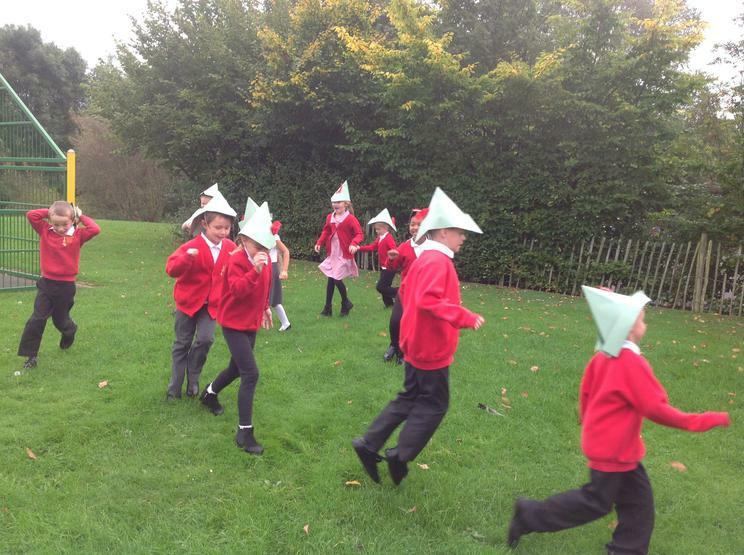 We followed instructions to make feathered hats and then wrote our own instructions to explain to others how to make a hat like ours. 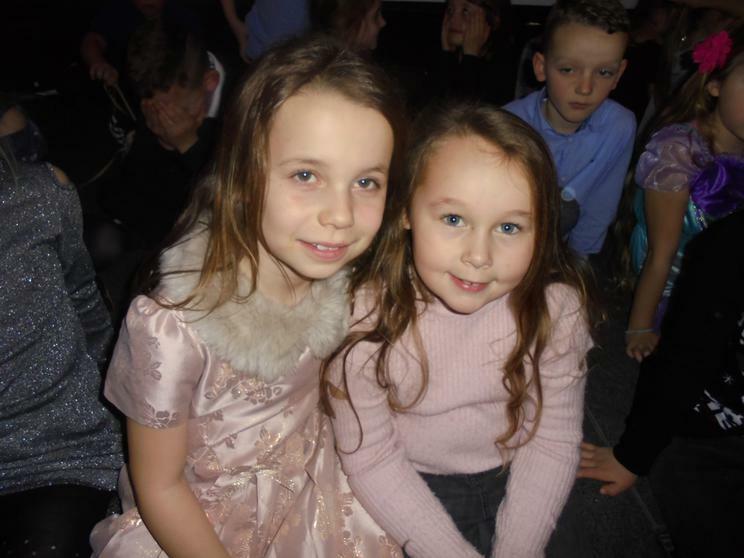 Do please take a look at our photos!